Hyperion is delighted to present Donald Runnicles, chief conductor of the BBC Scottish Symphony Orchestra, in his debut on the label. 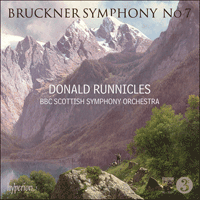 Runnicles commands his orchestra in Bruckner’s most popular symphony—repertoire that is at the heart of his musical life, and in which he has few living equals. Recent concerts of the works of Bruckner and Wagner have received the highest critical praise, acknowledging the orchestra and their conductor as consummate performers of this music. For Bruckner, the years leading up to the composition of the Seventh Symphony (1881–3) were a hard lesson in patience, to say nothing of the strain they put on his mental health and religious faith. Writing about the almost exactly contemporary Te Deum (1881–4), Bruckner explained to the conductor Hermann Levi that he had dedicated it ‘to God for having brought me through so much anguish in Vienna’. We do not enjoy upsetting the composer, whom we seriously respect as both a person and an artist, and who is certainly serious about art, however little he may have to do with it. For this reason, instead of criticizing him we would rather make the modest confession that we did not understand his gigantic symphony. His poetic intentions were not clear to us—perhaps a vision of how Beethoven’s Ninth befriends Wagner’s Walküre and ends by being trampled under her horses’ hooves. Unsurprisingly, Bruckner’s confidence—rocky at the best of times—very nearly collapsed. For over a year he wrote virtually nothing. There was little consolation in his personal life, despite the enthusiasm of a few zealous student friends (including the seventeen-year-old Gustav Mahler). The constant failure of his attempts to marry (Bruckner had a bizarre tendency to fall for unsuitably young women) further depressed him. There are also hints that he experienced religious doubts—as can perhaps be inferred from the curiously unresolved, or at the very least tonally ambiguous ending of the Sixth Symphony (1879–81). Yet the very fact that Bruckner kept going at all—and, moreover, kept writing symphonies—suggests that at the deepest level he must have had great strength of purpose. His sense that composing was for him a ‘vocation’ in the end proved sound. For many listeners that inner strength is evident in his symphonies—the Seventh very much included. Almost every time I visited Bruckner at his apartment in the Hessegasse, I found him sitting at his old-fashioned, bulky Bösendorfer grand piano, deep in the sketch of one of his symphonies, laboriously, with shaking hands, coaxing out the harmonies. These musical outlines were in themselves quite remarkable. As a rule only the violin or the top woodwind line was filled in, and in the bottom, the bass; in between was a yawning gap, and it wasn’t until much later that the remaining orchestral voices were added. The harmonic dimension and the arrangement of the orchestral voices were already clearly established in the Master’s inner ear, and here and there, underneath the bass line, would stand a note, usually in the form of a capital letter, to indicate the harmonic ‘fundamental tone’ of the passage in question. But what a wealth of unimagined beauty was revealed when I saw the very first bars of one newly begun work, the wonderful Seventh Symphony: where the string tremolos launch a deeply moving harmonic sequence that arches through a splendid chain of suspensions, bathing the main theme, on horn and cellos, in shafts of radiant sunlight! For most of the first movement Bruckner allows us only fleeting memories of his original vision; but then, near the end, comes a sudden hush, and the timpani enter for the first time, holding a pedal E, pianissimo. Above this a motif from the symphony’s opening melody aspires nobly, then turns with magnificent inevitability to the home key. Now the symphony’s opening motif rises steadily through the orchestra, a crescendo over a long-held E major triad. Bruckner almost certainly had the elemental one-chord crescendo the opens Wagner’s Das Rheingold at the back of his mind, but quite apart from the orchestral sound, the effect here is quite different—after all, this is an ending, not a beginning. It is said that Bruckner composed the Adagio in the knowledge that his idol Wagner hadn’t long to live. There is an unmistakable note of mourning in the noble first theme, in which Bruckner uses—for the first time—a quartet of the so-called ‘Wagner tubas’ (more like tenor and bass horns than the familiar bass tuba): Wagner had had these instruments created to enhance the brass section in his Ring cycle. Bruckner’s idolization of Wagner was so intense that it seems to have embarrassed even Wagner himself. And yet, in contrast to the music of some of Wagner’s other devotees, Bruckner rarely sounds like Wagner. Just before the Adagio’s lovely second theme (strings, 3/4), horn and tubas introduce a quotation from Tristan und Isolde (the chromatic rising figure in bars 2 and 3 of the opera’s Prelude), at its original pitch. But unless this is pointed out, the listener would be unlikely to notice it; the effect is pure Bruckner. [Ferdinand] Löwe and I have recently gone through the score of the Seventh with Bruckner, discussing one or two alterations and improvements. You probably don’t know that Nikisch has got him to agree to our cymbal clash in the Adagio (C major 6–4 chord), along with the triangle and the timpani—to our unbounded delight. ‘Our cymbal clash’—surely that clinches the matter! Yet the fact is that we shall almost certainly never know how many ‘alterations and improvements’ Bruckner made at the promptings of enthusiasts like Nikisch, Löwe and the Schalks. Contrary to popular belief, Bruckner was quite capable of putting up resistance when he really didn’t like an idea. And although he could be relatively puritan about instrumentation when it came to symphonies (harps were included in the Eighth only after a month-long struggle, according to his pupil Friedrich Eckstein), if he had doubts about the suitability of cymbals and triangle, why did he include them again in the Adagio of Symphony No 8? From a musicological point of view the issue is hard to resolve. In this recording, Donald Runnicles includes the percussion. Like many of Bruckner’s earlier scherzos, the Scherzo of the Seventh Symphony reveals its rustic Upper Austrian roots at almost every turn—in his younger days Bruckner had boosted his meagre teacher’s salary by playing in village dance bands. However there is an obsessive, elemental drive here, which is to become still more pronounced in the scherzos of the next two symphonies. The Trio is much gentler, more songful, featuring Bruckner’s signature ONE-two ONE-two-three rhythm. Pour Bruckner, les années précédant la composition de sa Symphonie nº 7 (1881–3) furent une dure leçon de patience qui éprouva rudement sa santé mentale et sa foi. N’écrivit-il pas au chef d’orchestre Hermann Levi avoir dédié son Te Deum presque contemporain (1881–4) «à Dieu pour m’avoir sorti d’une si grande angoisse à Vienne»? Il ne nous plaît pas de tracasser le compositeur, que nous respectons sincèrement comme homme et comme artiste, probablement sincère en art, même s’il a peu à voir avec l’art. Au lieu de le critiquer, nous avouerons donc modestement n’avoir rien compris à sa gigantesque symphonie. Ses intentions poétiques furent, pour nous, tout sauf limpides—peut-être un peu comme si la Neuvième de Beethoven avait donné son amitié à la Walküre de Wagner pour finir piétinée par ses chevaux. Naturellement, la confiance de Bruckner—inébranlable dans les meilleurs moments—s’effondra presque totalement. Pendant plus d’un an, il n’écrivit pratiquement rien et, malgré l’enthousiasme de quelques amis zélés (dont Gustav Mahler, alors âgé de dix-sept ans), sa vie privée ne lui apporta guère de consolation. L’échec constant de ses tentatives de mariage ne fit qu’ajouter à sa dépression (il avait bizarrement tendance à s’amouracher de femmes inconvenablement jeunes). Certains indices donnent à penser qu’il éprouva aussi des doutes quant à sa foi—comme on peut peut-être le déduire de la conclusion curieusement non résolue, ou à tout le moins tonalement ambiguë, de sa Symphonie nº 6 (1879–1881). Pourtant, le fait même qu’il ait toujours composé—y compris des symphonies—dit toute la résolution qui, au fond de lui, l’animait. En fin de compte, il avait, chevillé au corps, le sentiment que sa «vocation» était de composer. Pour beaucoup d’auditeurs, ses symphonies dégagent une manifeste puissance intérieure—et la septième n’est pas en reste. Chaque fois ou presque que j’allais voir Bruckner à son appartement de la Hessegasse, je le trouvais assis à son vieil et encombrant piano Bösendorfer, laborieusement plongé dans l’ébauche d’une de ses symphonies, les mains tremblantes, à s’échiner sur les harmonies. Ces esquisses étaient en elles-mêmes des plus remarquables. Généralement, seule la ligne de violon ou la ligne supérieure des bois était remplie avec, en bas, la basse; entre les deux, il y avait un vide, et c’était seulement bien plus tard que les autres voix orchestrales étaient ajoutées. Leur dimension harmonique et leur agencement étaient déjà clairement établis dans l’oreille interne du maître et, çà et là, apparaissait sous la ligne de basse une note, ordinairement sous la forme d’une majuscule, pour indiquer la «note fondamentale» harmonique du passage en question. Mais quel trésor de beauté inimaginable s’offrit à moi quand je vis les toutes premières mesures d’une œuvre à peine commencée, la merveilleuse Symphonie nº 7: là où les trémolos de cordes lancent une séquence harmonique très émouvante qui surplombe en arche une splendide chaîne de retards, inondant le thème principal, au cor et aux violoncelles, de rais d’une lumière éclatante! Et, en fin de compte, toujours pour le mieux. Pendant l’essentiel du premier mouvement, Bruckner ne nous laisse que des souvenirs fugaces de sa conception originelle; mais, vers la fin, un calme brutal survient et les timbales entrent pour la première fois, en tenant un mi pédale, pianissimo, par-dessus lequel un motif de la mélodie inaugurale de la Symphonie s’élève majestueusement avant de virer, avec une magnifique inévitabilité, vers le ton principal. Le motif inaugural monte alors peu à peu dans l’orchestre, crescendo, par-dessus un accord parfait de mi majeur tenu. En écrivant cela, Bruckner songeait certainement au fondamental crescendo d’un accord qui ouvre Das Rheingold de Wagner mais, en dehors de la sonorité orchestrale, l’effet est ici tout autre—après tout, c’est une fin, non un début. Bruckner aurait composé l’Adagio en sachant que son idole Wagner allait bientôt mourir et le majestueux premier thème exsude une flagrante note éplorée, avec—pour la première fois—un quatuor de «tubas Wagner» (cet instrument, qui tient plus du bugle alto et du bass-horn que de l’habituel tuba basse, avait été créé par Wagner pour rehausser les cuivres de son Ring). Son idolâtrie était si intense qu’elle aurait embarrassé jusqu’à Wagner lui-même. Pourtant, contrairement à celle d’autres dévots, sa musique sonne rarement comme du Wagner. Juste avant le charmant second thème de l’Adagio (cordes, 3/4), cor et tubas introduisent une citation de Tristan und Isolde (la figure chromatique ascendante des mesures 2 et 3 du Prélude), dont ils conservent la hauteur de son. Mais si personne ne le lui fait remarquer, l’auditeur ne s’en apercevra probablement pas: l’effet est purement brucknérien. [Ferdinand] Löwe et moi avons dernièrement examiné la partition de la Septième avec Bruckner et discuté d’une ou deux modifications et améliorations. Tu ignores probablement que Nikisch a arraché son accord pour notre coup de cymbales dans l’Adagio (accord de sixte et quarte en ut majeur), avec le triangle et les timbales—à notre incommensurable joie. «Notre coup de cymbales»—voilà qui résout à coup sûr l’affaire! Mais le fait est que nous ne saurons très certainement jamais combien de «modifications» et d’«améliorations» Bruckner fit sur l’insistance des Nikisch, Löwe et autres Schalk. Contrairement à ce qu’on croit, pourtant, il savait fort bien résister quand une idée lui déplaisait vraiment. Et bien qu’il pût être relativement puriste en matière d’instrumentation symphonique (les harpes n’intégrèrent la Symphonie nº 8 qu’au bout d’un mois de bataille, à en croire son élève Friedrich Eckstein), s’il avait douté du bien-fondé des cymbales et du triangle, pourquoi les introduire de nouveau dans l’Adagio de sa Symphonie nº 8? Musicologiquement parlant, c’est là une question difficile à trancher. Sur ce disque, Donald Runnicles intègre la percussion. Comme nombre des scherzos brucknériens antérieurs, celui de la Symphonie nº 7 dit et redit combien il est ancré dans la Haute-Autriche campagnarde—dans sa jeunesse, Bruckner avait amélioré son maigre salaire de professeur en jouant dans des orchestres de danse villageois. Mais on sent là un élan fondamental, obsessionnel, qui s’amplifiera encore dans les scherzos des deux symphonies suivantes. Le Trio, beaucoup plus doux, plus mélodieux, met en œuvre le rythme caractéristique de Bruckner, UN-deux UN-deux-trois. Für Bruckner waren die Jahre, die der Komposition der Siebten Symphonie (1881–83) vorangingen, eine harte Geduldsprobe, ganz zu schweigen von dem Druck, den sie auf seine seelische Verfassung und seinen Glauben ausübten. Als er über das fast gleichzeitig entstandene Te Deum (1881–84) schrieb, erklärte Bruckner dem Dirigenten Hermann Levi, dass er es „Gott widmete, zur Danksagung für so viele überstandene Leiden in Wien“. Wir möchten dem als Menschen und Künstler von uns aufrichtig geehrten Komponisten, der es mit der Kunst ehrlich meint, so seltsam er mit ihr umgeht, nicht gerne wehtun, darum setzen wir an die Stelle einer Kritik lieber das bescheidene Geständnis, daß wir seine gigantische Symphonie nicht verstanden haben. Weder seine poetischen Intentionen wurden uns klar—vielleicht eine Vision, wie Beethovens „Neunte“ mit Wagners Walküre Freundschaft schließt und endlich unter die Hufe ihrer Pferde gerät—noch den rein musikalischen Zusammenhang vermochten wir zu fassen. Es ist kaum überraschend, dass Bruckners Selbstvertrauen—das im besten Falle als wackelig zu bezeichnen war—fast völlig einstürzte. Über ein Jahr lang schrieb er praktisch nichts. Auch sein Privatleben bot ihm, trotz der Begeisterung einiger eifriger befreundeter Schüler (darunter der 17-jährige Mahler), kaum Trost. Seine Heiratspläne, die immer wieder platzten (Bruckner hatte eine seltsame Tendenz, sich immer wieder in zu junge Frauen zu verlieben), deprimierten ihn umso mehr. Außerdem zweifelte er wohl auch an seinem Glauben—was vielleicht dem merkwürdig unaufgelösten oder zumindest tonal mehrdeutigen Ende der Sechsten Symphonie (1879–81) entnommen werden kann. Doch ist schon die Tatsache, dass Bruckner überhaupt weiterarbeitete—und überdies weiterhin Symphonien komponierte—, ein Hinweis darauf, dass er eine starke innere Entschlossenheit besessen haben muss. Seine Überzeugung, dass das Komponieren für ihn eine „Berufung“ war, sollte sich letztendlich als solide herausstellen. Für viele Hörer ist diese innere Stärke in seinen Symphonien offensichtlich, und die Siebte bildet dabei keine Ausnahme. Fast jedesmal, wenn ich Bruckner in seiner Wohnung in der Heßgasse besuchte, fand ich ihn an seinem altmodischen, unförmlich langen Bösendorferflügel sitzend, ganz in die Partiturskizze zu einer von seinen Symphonien vertieft und mühsam, mit zitternden Händen, die Akkorde greifend. Diese Entwürfe waren merkwürdig genug. In der Regel war nur die oberste Zeile der Holzbläser oder die Geigenstimme ausgefüllt und ganz unten jene der Bässe; dazwischen aber eine gähnende Leere, die erst einer späteren Niederschrift der Noten für die übrigen Orchesterstimmen harrte. Der harmonische Zusammenhang des Ganzen, ebenso wie die instrumentale Gruppierung, war dem inneren Ohr des Meisters bereits völlig deutlich und nur hier und dort war, unterhalb der Baßzeile, eine Notierung, gewöhnlich ein großer Buchstabe, der, als Wegweiser gleichsam, den harmonischen „Fundamentalton“ der betreffenden Stelle angeben sollte. Aber welche Fülle bisher ungeahnter Schönheiten offenbarten mir gleich die ersten Takte dieses wunderbaren Werkes, der vor kurzem begonnenen Siebenten Symphonie, dort wo die Tremoli der Streicher eine tief ergreifende, tonal in sich zurückkehrende Sequenz mit einer prachtvoll klingenden Kette von Vorhalten zu Gehör bringen, die das von Horn und Cello vorgetragene Hauptthema in eine ganz eigenartige, sonnenhaft strahlende Beleuchtung stellen! und zu guter Letzt löst sich alles in Wohlgefallen auf. Im größten Teil des ersten Satzes gewährt Bruckner uns nur flüchtige Erinnerungen an seine ursprüngliche Vision; doch dann, kurz vor Ende, kommt eine plötzliche Stille und die Pauke setzt zum ersten Mal ein und hält im Pianissimo ein orgelpunktartiges E. Darüber erhebt sich in nobler Weise ein Motiv aus der Anfangsmelodie der Symphonie und wendet sich dann mit großartiger Unvermeidlichkeit der Grundtonart zu. Nun steigt das Anfangsmotiv unaufhaltsam in einem Crescendo über einem lang ausgehaltenen E-Dur-Dreiklang durch die Reihen des Orchesters empor. Man kann wohl davon ausgehen, dass Bruckner dabei das elementare Crescendo innerhalb eines Akkords im Hinterkopf hatte, mit dem Das Rheingold von Wagner beginnt; doch, von dem Orchesterklang einmal abgesehen, ist der Effekt hier ein ganz anderer—es ist dies schließlich ein Ende und kein Anfang. Es wird behauptet, dass Bruckner das Adagio in dem Wissen komponierte, dass sein Vorbild Wagner nicht mehr lange leben würde. In dem noblen ersten Thema ist ein unmissverständlicher Ausdruck der Trauer, wobei Bruckner—zum ersten Mal—ein Quartett der sogenannten „Wagner-Tuben“ (die eher wie Tenor- bzw. Basshörner als die eigentliche Tuba klingen) einsetzt: Wagner hatte diese Instrumente für den Blechbläserapparat seines Ring des Nibelungen bauen lassen. Bruckners Verehrung Wagners war derart intensiv, dass offenbar selbst Wagner davon peinlich berührt war. Und doch klingt Bruckners Musik, im Unterschied zu den Werken anderer Wagner-Anhänger, nur selten wie Wagner. Kurz vor dem wunderschönen zweiten Thema des Adagios (Streicher, 3/4) spielen Horn und Tuben ein Zitat aus Tristan und Isolde (die aufsteigende chromatische Figur aus dem 2. und 3. Takt des Vorspiels der Oper) in der ursprünglichen Tonhöhe. Es ist unwahrscheinlich, dass dem Hörer dies auffallen würde, es sei denn, er würde ausdrücklich darauf hingewiesen; die Passage klingt wie purer Bruckner. Neulich habe ich und [Ferdinand] Loewe mit Bruckner die Partitur der Siebenten durchgegangen, bezüglich einiger Änderungen und Verbesserungen. Du weißt vielleicht nicht, daß Nikisch den von uns ersehnten Beckenschlag im Adagio (C-Dur und 6–4 Akkord) sowie Triangel und Becken durchgesetzt hat, was uns unbändig freut. „Den von uns ersehnten Beckenschlag“—das dürfte den Sachverhalt wohl klären! Allerdings werden wir wohl nie herausbekommen können, wie viele „Änderungen und Verbesserungen“ Bruckner auf das Drängen von Anhängern wie Nikisch, Löwe und den Schalks hin vornahm. Entgegen der allgemeinen Auffassung, dass Bruckner sich von anderen sehr beeinflussen ließ, war er durchaus imstande, Widerstand zu leisten, wenn ihm ein Vorschlag gar nicht gefiel. Und obwohl er in den Symphonien recht puritanische Ansichten bezüglich der Instrumentierung hatte (seinem Schüler Friedrich Eckstein zufolge nahm er Harfen in seine Achte erst nach einem einmonatigen Kampf auf), wenn er die Tauglichkeit des Beckens und der Triangel bezweifelte, warum komponierte er sie dann im Adagio seiner Achten Symphonie wieder mit ein? Aus musikwissenschaftlicher Sicht ist diese Frage nur schwer zu klären. Bei dieser Aufnahme hat Donald Runnicles sich für den Beckenschlag entschieden. Ebenso wie viele frühere Scherzi Bruckners verrät auch das Scherzo der Siebten Symphonie praktisch durchgängig seine ländlichen oberösterreichischen Wurzeln—in jüngeren Jahren hatte Bruckner sein mageres Lehrergehalt aufgebessert, indem er in ländlichen Tanzkapellen aufgespielt hatte. Doch macht sich hier ein obsessiver, elementarer Zug bemerkbar, der in den Scherzi der nächsten beiden Symphonien noch ausgeprägter werden sollte. Das Trio ist deutlich sanfter, liedhafter und steht in Bruckners typischem EINS-zwei EINS-zwei-drei-Rhythmus.